"Sampath Speaking" - the thoughts of an Insurer from Thiruvallikkeni: why Australian Open finals was a great achievement for Petra Kvitova !! why Australian Open finals was a great achievement for Petra Kvitova !! Champions are made of sterner stuff !! Tennis fans enjoyed 2019 Australian Open which was 107th edition of the tournament. The tournament is run by the International Tennis Federation (ITF) and is part of the 2019 ATP Tour and the 2019 WTA Tour calendars under the Grand Slam category. The tournament consists of both men's and women's singles and doubles draws as well as the mixed doubles events. This is a tournament played on hard courts, across a series of 25 courts, including the three main show courts Rod Laver Arena, Melbourne Arena and Margaret Court Arena. Just before Wimbledon, at a WTA Tour function by the Thames, Petra Kvitova met Monica Seles, with whom she has much in common for a reason both would like to forget. .. .. and that had a link in the place where Australian Open was fought ! The Australian Open has, for years now, been the scene of thrilling breakthroughs and the making of stars in the women’s game. It’s where Martina Hingis won her first Grand Slam title in 1997, aged just 16. It’s where a teenaged Amelie Mauresmo announced herself to the world with a run to the final in 1999. In more recent years, it was where a trio of 19-year-olds – Sloane Stephens, Eugenie Bouchard and Madison Keys – made exciting runs to the semifinals in 2013, 2014 and 2015 respectively. This year, Naomi Osaka was the latest young champion, improving in a big way on her fourth-round run in 2018 by going all the way to the title. Naomi Osaka won the title, defeating Petra Kvitová 7–6(7–2), 5–7, 6–4 in the final. Serena Williams was attempting to equal Margaret Court's all-time record of 24 Grand Slam singles titles, but lost in the quarterfinals to Plíšková. Amanda Anisimova became the first player born in the 21st century to advance to the fourth round of a Grand Slam singles tournament. 2019 Australian Open was a Grand Slam tennis tournament that took place at Melbourne Park from 14 to 27 January 2019. It was the 107th edition of the Australian Open, the 51st in the Open Era, and the first Grand Slam of the year. As in previous years, the tournament's main sponsor was Kia. This was the first Australian Open to feature final set tie-breaks, which have been introduced for all match formats. If the match reaches 6–6 in the final set, the first player to score 10 points and be leading by at least 2 points wins the match. Katie Boulter and Ekaterina Makarova were the first players in a main draw to compete in the new tie-break format. For the first time in the men's singles competition, a 10-minute break due to heat was allowed after the third set when the Australian Open Heat Stress Scale reaches 4.0 or higher. In a five-year deal starting at the 2019 tournament, Dunlop took over from Wilson as the suppliers of the tennis balls. Hawkeye was extended to be included on all courts. Roger Federer and Caroline Wozniacki were the defending men's and women's singles champions, but were unsuccessful in their title defense, with Federer losing to Stefanos Tsitsipas in the fourth round and Wozniacki losing to Maria Sharapova in the third round. This is a post on the losing finalist Petra Kvitova !! ~ She has estified in the Czech Republic at the trial of the man who allegedly knifed her in her home. After the December 2016 attack in Prostejov, Kvitova had surgery lasting over four hours to injuries to her playing left hand. It took the tennis star more than five months to recover. Her testimony was requested by a lawyer for the suspect, the 33-year-old Radim Zondra. The suspect, faces 12 years in prison if he is found guilty. 'I screamed, there was bloody everywhere,' Kvitova was quoted as saying by the CTK news agency. 'I had a knife on my neck from behind.' 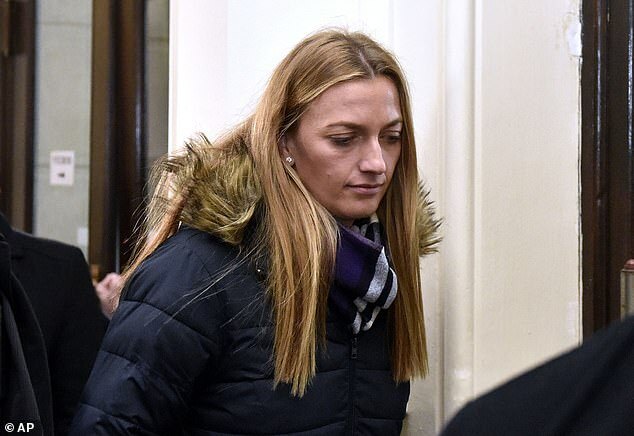 Kvitova didn't enter the courtroom where the trial took place on Tuesday in a regional court in Brno, but testified from a separate room to avoid facing the suspect. The suspect posed as a utility man seeking to read a meter to gain access to the apartment in Prostejov before a struggle ensued. Kvitova was at home awaiting a routing doping test. It is understood the knife was put to Kvitova's throat after being asked run hot water in the bath and her left hand was injured as she pulled the weapon away. When she later offered him money, he accepted 10,000 Czech crowns (£343) and left. Just before Wimbledon, at a WTA Tour function by the Thames, Petra Kvitova met Monica Seles, with whom she has much in common for a reason both would like to forget. The two champions have been victims of knife attacks that could have ended their careers, something they fought hard to ensure would not become the case. Saturday's Australian Open final place was where Seles won a Grand Slam in 1996 more than two years after she was stabbed by a deranged fan in Hamburg. Some are made of steel !